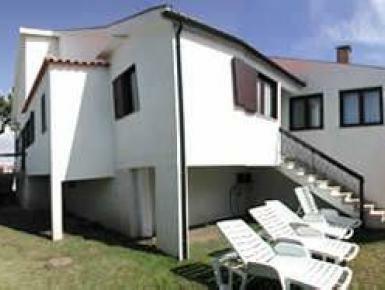 This private villa is located only 200 meters from the beach of Apúlia, 8 Km from Esposende. Porto international airport is 35 Km. It consists of 4 bedrooms (2 of them with ensuite bathrooms and one of them without windows), another bathroom, 1 WC, living room with satellite TV and fireplace, dining room and fully equipped kitchen (hob, oven, refrigerator/freezer, dishwasher). Furthermore, there is a small backyard garden with grill and garden furniture and a basement with parking place for 2 cars and wash machine. Sleeps up to 8, self catering.